Measurement data transmission via Fast Ethernet 100MBit/s. Measurement data transmission via RS 232/422 serial interface. Measurement data reduction, measurement data processing and measurement data filtering in the interface box. Service interface for configuring measurement applications and detection fields. With the ROD 4plus, it is possible to save and switch between 4 detection fields for object detection. ROD 4-08plus with heating, dust-insensitive version. RODplussoft software for configuring measurement applications. RODsoft software for configuring detection fields. 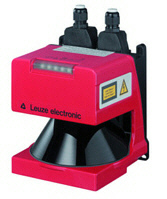 Purchase your Leuze RotoScan ROD 4plus Optical Distance Sensors today!